Adam Davidson Adam Davidson is a contributor to Planet Money, a co-production of NPR and This American Life. He also writes the weekly "It's the Economy" column for the New York Times Magazine. November 7, 2014  The face of manufacturing has changed. In the future, the pool of workers is expected to be smaller. And if workers want to succeed, they'll need continuous improvement with on-the-job education. August 22, 2013  More than 330,000 people filed new claims for unemployment insurance benefits last week. That sounds like a big number — and is a slight increase over the previous week — but it's being taken as some very good news. For a month, now, fewer new people are asking for unemployment insurance than at any time since November, 2007. That's before the Great Recession. July 30, 2013  The local food movement has received a lot of attention both for changing diets and buying habits. But has the movement has become a significant economic force? July 9, 2013  We examine how the exchange rate between the Euro and the U.S. dollar reflects the health of the global economy. July 3, 2013  Just in time for Independence Day, a new study undermines one of American's most sacred notions, the American Dream. New research on economic mobility shows it is increasing in Britain and shrinking in the U.S.
June 18, 2013  Melissa Block talks to Adam Davidson about growing income inequality at every level of our economy. Davidson has been pouring over data recently released from the Bureau of Labor Statistics. June 13, 2013  Some trading firms have found a way to get an advanced peek at crucial economic data before anyone else. May 24, 2013  Robert Siegel talks with Adam Davidson from Planet Money team about this week's cluster of positive data on the health of the U.S. housing market. Davidson says the strength of the housing sector is now irrefutable, even though a broader economic recovery is still years away. May 14, 2013  Audie Cornish talks with Adam Davidson about the Labor Department's release of the import and export price indexes on Tuesday. The data underscore the difficulty of managing the U.S. economic recovery in the interconnected global economy. May 8, 2013  The Senate Judiciary Committee is beginning work Thursday on a proposal to overhaul the nation's immigration laws. Audie Cornish talks with Adam Davidson of the Planet Money team about what academic research says about the economic impact of immigration. May 3, 2013  Melissa Block talks with Adam Davidson about Friday's unemployment report for April and the methodology that underlies it. April 4, 2013  Every week, the Department of Labor issues data detailing the number of people who filed for unemployment benefits in the previous week. According to Thursday's report, 385,000 people filed last week, the third weekly increase in a row, and a higher figure than expected. 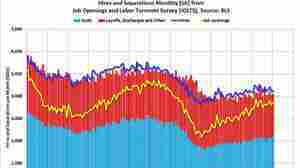 Robert Siegel talks with Adam Davidson about this week's initial claims report. Davidson says the report can help illuminate the vital question of whether the United States has a cyclical or a structural unemployment problem. March 12, 2013  Even in good economic times, new jobs are constantly being created and old jobs are constantly being destroyed. March 6, 2013  The Dow Jones Industrial Average closed at a record high Tuesday, but only if you look at the Dow in non-inflation-adjusted terms. Adam Davidson of the Planet Money team tells Melissa Block that the Dow is of almost no value as a measure of U.S. economic activity. March 5, 2013  A break down of who buys and what exactly sells at the U.S. Treasury bond auctions.